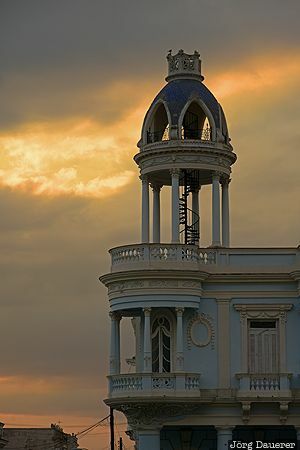 The small tower on top of Palacio Ferrer at Plaza de Armas in downtown Cienfuegos in front of a colorful sunset sky. Cienfuegos is the capital of the province Cienfuegos in the south west of Cuba. This photo was taken in the evening of a cloudy day in March of 2016. This photo was taken with a digital camera.